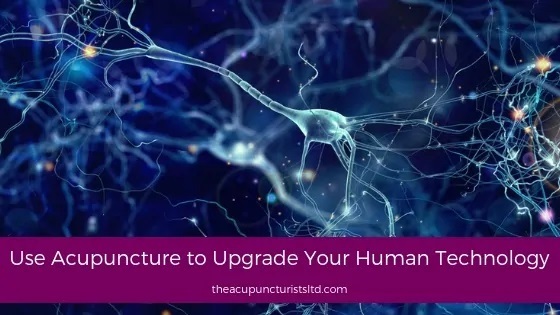 Acupuncture is a brilliantly effective way of re-setting your body’s systems to make sure you’re operating at your peak – physically and emotionally. There was a time, not all that long ago, when mobile phones were the size of a brick and their only purpose was to allow us to make calls on the move without having to find change for a phone box. These days the mobile phone is a powerful computer that fits in the palm of our hand. In fact, our world is now so technologically advanced that we’ve become completely dependent on gadgetry to run our lives and it’s almost impossible to think of a time when we couldn’t do our shopping whilst sitting on a train. But the advances in our world have also made us quite demanding. When our IT systems run slowly, we’re quick to call in the IT department to sort them out, or to take the faulty kit in for repair; we get twitchy if we haven’t upgraded our phones in two years; we constantly upcycle – records to laser discs to CDs to minidiscs to mp3 files to on-demand streaming. Life has become a never-ending – or rarely-sleeping – quest for improvement in the technology that helps us to live our lives easily, conveniently and effectively. Yet, the majority of us are guilty of neglecting the most powerful piece of technology we possess: our body. Physically and mentally, we are significantly more advanced than the most sophisticated piece of technology in existence today – a priceless piece of machinery capable of processing information and data significantly faster than any server at NASA. When our Macbook (or Chromebook or Windows Surface Pro) doesn’t do what we need it to do, we get it looked at, pay for whatever upgrades or repairs are needed and then get back to business. If we’re sensible, we take our car to be serviced each year to prevent problems developing, and if something does go wrong, we take it to the garage to be mended. If we could bottle the computing potential locked inside us, how much, I wonder, would it be worth as a commercial commodity? I don’t know the answer, obviously – but it’s certainly more than a Macbook or a Mercedes. So, why don’t we take the same care with our bodies as we do with the material things in our lives? We get headaches, or hay fever, or back pain, or we become stressed, and what’s our response? We just push on through, because we figure we’ll get over it in time. For a time that might be the case. We get over the cold, the hay fever passes, we find ways of compensating for the pain by moving differently, we learn to mask our stress with coping mechanisms and everything seems better; but what happens in the end is that either the intervals between these episodic events becomes increasingly shorter – or the symptoms, when they do present themselves, become more intense. But acupuncture can be a secret weapon in staying on top of your health because the way this ancient Chinese treatment works is to treat the whole of your body every time, which makes it singularly different to traditional Western medicine and why so many doctors and health professionals recommend acupuncture as a complementary treatment. When you come to us because you have musculoskeletal pain, for example, the first thing we’ll do – after we’ve talked through your medical history and got some information about your lifestyle – is to assess the energy flow that connects the various acupuncture points on the body. This energy is known as Qi (and pronounced ‘chee’) and the network through which Qi flows is known as the Jingluo. From this we’ll be able to work out where your energy imbalances are and then use that information to treat the cause – and the cause is often very different to where the symptoms actually manifest. You may have a headache, but what’s causing it could in a completely different part of the body. Getting checked out when things are obviously amiss is just the start. Statistics show that for every 27 people who go for a routine NHS check-up, one is diagnosed with high blood pressure, or hypertension. The figures for people diagnosed with diabetes or kidney diseases are equally surprising. The point here is that we often don’t know what’s going on inside our bodies, but where we do experience symptoms that something isn’t right, why would we not get them checked out? Your body is a complex mix of physical, emotional, psychological and spiritual elements and you only get one model to work with for the whole of your life. How you feel on the inside and the outside has a material effect on your happiness, success and productivity – and acupuncture can make sure that by acting on the symptoms that can be seen or felt, you stay on top of the symptoms that can’t. If you’d like to find out more about acupuncture and how regular sessions can help to keep you in the best possible health, get in touch for an informal, confidential chat.